Can The Orca/Marine Mammal Rights Community Take Action? Sometimes people ask me why efforts to change or end the use of marine mammals in entertainment shows hasn’t gained more traction. I don’t really know how to answer, but I do know from other work that I have done that any grassroots movement occasionally needs to focus and act, especially when there is an opportunity to achieve something concrete. I thought of this when I saw Phil Demers’ latest plea for help in the legal battle he and other whistleblowers are fighting against Marineland. Marineland has been suing former employees left and right, in an effort to drain their bank accounts and force them to retract their devastating allegations regarding the way Marineland treats its marine mammals. Demers and his fellow whistleblowers desperately need help paying their legal bills, and if they can continue to mount a legal defense pressure will grow on Marineland because the cases will get to a discovery phase, which could force Marineland to cough up documents and information about its operations. And, as it happens, there is easy money out there, courtesy of the BiLLe Celeb Challenge–if the community of people who care about marine mammals in captivity can mobilize and take action. Urgent call to action re: Marineland. 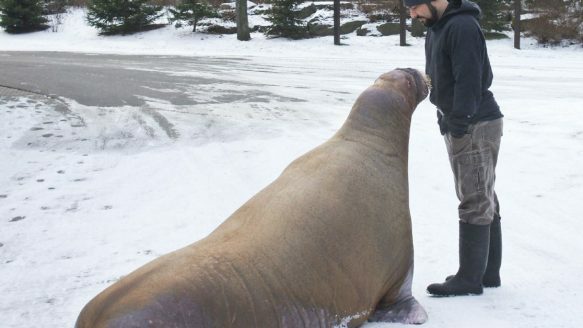 Marineland’s whistleblowers urgently need your help. Les Stroud of the famed television show “Survivorman”, in conjunction with Orca Conservancy has generously sponsored us in the BiLLe Celeb Challenge. We are currently in 2nd place with only a week to go and URGENTLY need your daily vote to ensure us the victory award of 25 000$ towards our legal defense. Voting is easy and FREE! Simply register at http://celebcharitychallenge.org/ and vote for LES STROUD daily. Marineland’s animals are counting on us, and we’re counting on you. We are also accepting monetary contributions at http://www.indiegogo.com/projects/legal-defense-fund/x/1197869 to help us continue in both our crucial legal battles and our Ontario captive animal advocacy. Thank you for your continued support and please STAY TUNED! That’s pretty simple. But it will be an interesting test of whether a community that clearly cares about this issue can rally and achieve something concrete and meaningful. If it can’t that will help answer the question of why more hasn’t been achieved. Can you vote if you don’t want to meet a celebrity? Absolutely. I am with you on that one. Just want to help Phil Demers and the others with some legal funding.